When I write about a new Moon, I am always in the dark of the old Moon. And instead of the high energy of the full Moon, we have to wait for several days to see the proof of a new birth in the sky as she sets at sundown. Unlike the full Moon where we are on a journey of greater and greater manifestation and integration, the new Moon begins a new cycle, preceded by the finish of the old–there is a sense of hurry, the light is fading. But to continue the complexity of the last few Moons, this one is in the last few degrees of the sign of Aries. The Moon will begin anew linked to the final days of the Sun in spring’s fiery initiation. Like all new things, the new Moon is born from darkness. Here in New England we have experienced a winter like no other with unending cold and storms. The earth has been sealed shut under layers of snow. What will emerge, what plants and animals survived is still a mystery. 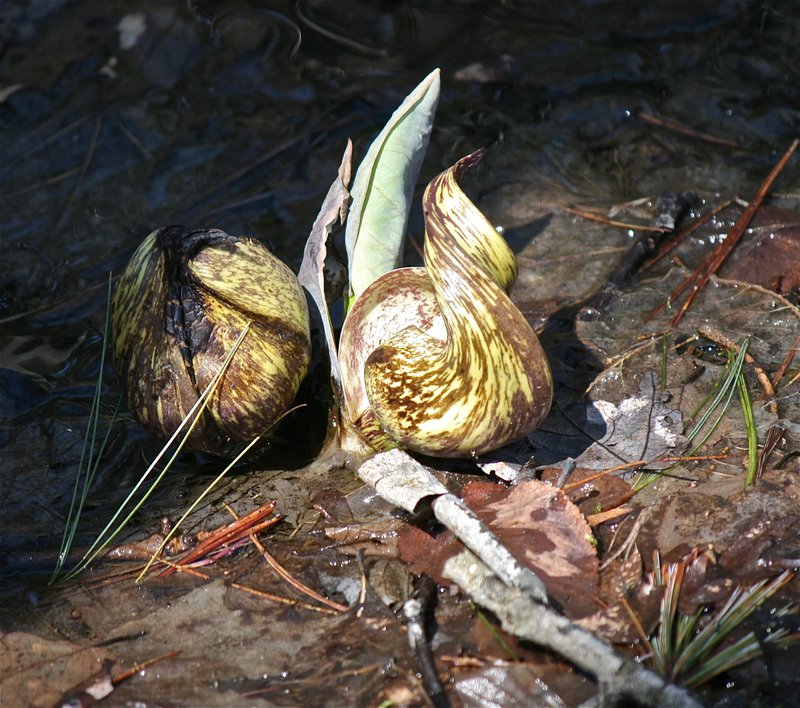 That most ancient of plants, the skunk cabbage is definitely up and out, unfolding in a spiral deeply rooted in dark swamps. This new Moon of Saille, the Willow, celebrates water, the great transformer. The Willow belongs to the Moon, and grows close by or sometimes, knee deep in water. Willow is an herbal remedy, which cools fevers, and heals the ravages of damp diseases. White Willow bark is lovely tea for achy joints from arthritis and rheumatism, or any kind of swelling. Aspirin is Salicylic acid taken from the word Saille, Willow, and originally made from the Willow herself. Willow (Saille) is associated with the feminine energies of the earth and sky. This is a good time to stop to listen and respect your intuition, your powers of divination and your connection to ancestral spirits. 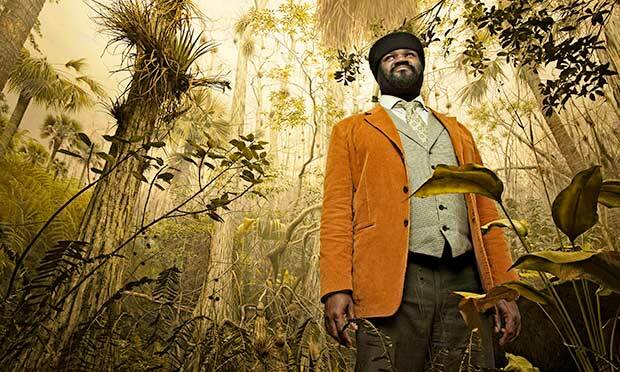 Here is a beautiful tribute to Water from Gregory Porter: ‘Liquid Spirit’. https://www.youtube.com/watch?v=NS6JV-veVAE. Are we not alive in a time of water consciousness? While the oceans fill with melting ice from both poles, many lands are turning to desert, and California, that paradise of fertility is now in crisis because water will not come when it is needed. Water in solid form has stood three feet deep for months, holding back spring for my garden. Moon and Sun meet at 28° Aries, and listen to the Sabian Symbol held at this degree: ‘The Music of the Spheres … Attunement of Cosmic Order. 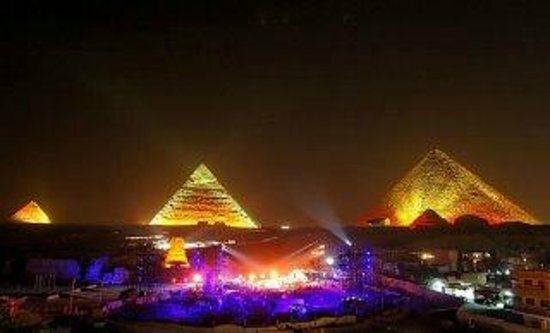 The music of the Spheres is the celestial embodiment of principles of polyphonic interplay. 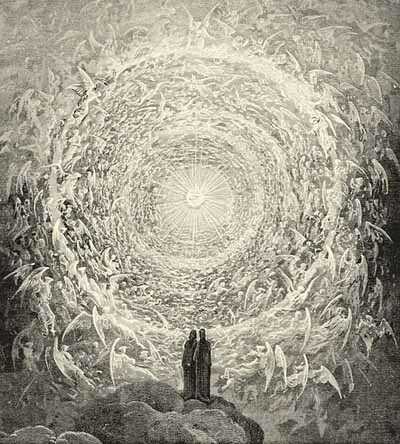 The individual advancing ‘on the Path’ should seek to understand and realize his place in the vast scheme of mankind’s evolution, in the immense chord of the harmony of the universe… Listen to the inner voice.’ Dane Rudhyar, An Astrological Mandala. The chart of this poignant moment on April 18th contains a powerful T-Square. Venus, our lady of beauty and love, and Saturn, teacher and he who constricts spirit into material form are in opposition. This is a combination most artists know well. Venus is there to inspire, while Saturn demands the ceaseless work needed to make inspiration into form. 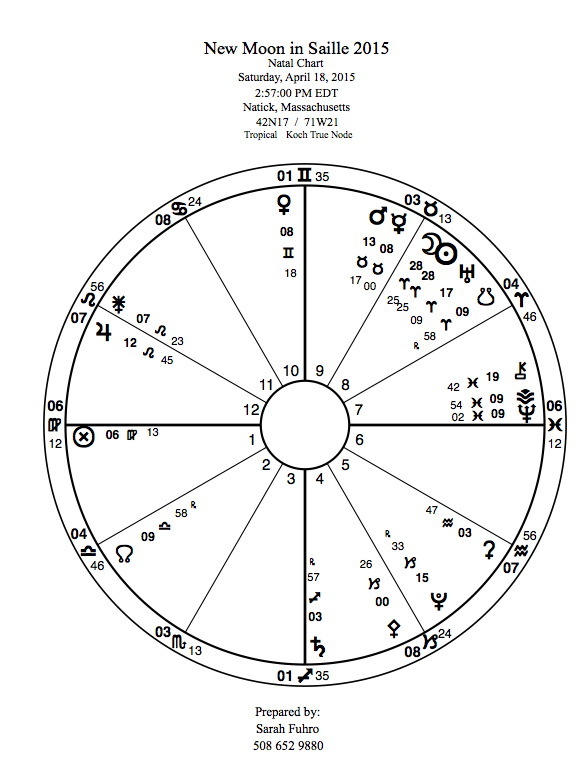 Neptune and Vesta square them, like a bow pulled back to shoot an arrow at the Point of Fortune in the chart. Neptune is the universal form of Venus….Cosmic Music of the Spheres. And what about the virgin goddess Vesta, Hestia of the hearth? She is the companion of Neptune in this triangle of love and mutable potential. A triangle is a stable form. Take something wordless, universal, full of music (Neptune), pair it with the sweet surety of the inner voice (Vesta), and bring it into form (Saturn) as an act of love (Venus). Take the tide of this new Moon where it wants to go! I want to share the poem which celebrates this April Moon of Saille in the 2015 Lunar Calendar ( http://www.thelunapress.com). 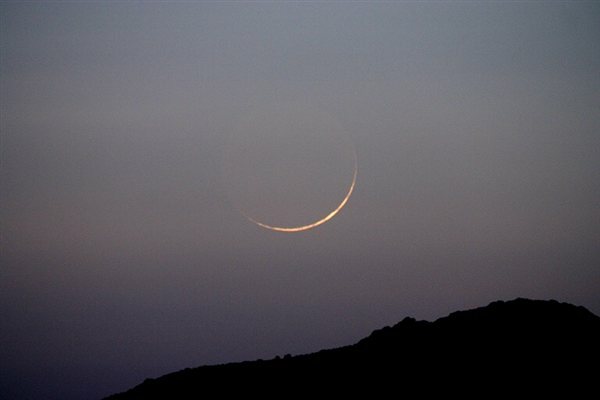 the secrets of a new moon in April? The Wisdom Tradition evolved over the centuries to address our deepest human needs. Sarah Fuhro is a practitioner of its many forms; including Astrology, Tarot, Flower Essences and Druidry. In addition to personal consultations, Sarah teaches workshops and private classes, offering both clients and students knowledge powerfully rooted in the past, presented in the language of the present. To learn more, please visit www.sarahfuhro.com or Facebook https://www.facebook.com/pages/Sarah-Fuhro-Star-Flower-Alchemy-Astrology-Flower-Essences-and-Tarot/71299491502.